Built in 1890, the Connemara Public Library is not just one of the oldest libraries in the country, it is also one of the biggest and most beautiful buildings as well. If you’ve never seen the large circular red building while driving down Pantheon Road in Egmore, then you’ve definitely missed this library. Originally part of The Pantheon (where the name for the road comes from), the Connemara Public Library was part of a series of buildings that shared space but different architectural styles from Indo-Saracenic and Gothic to Neo-Byzantine, Rajput, Mughal, and Dravidian architecture. In 1973, a section was added to the library with a whole slew of new collections of books – they now have over 600,000 books in the library! Named after Lord Connemara, the former Governor of Madras, the library only asked for a small deposit from their members to use the facilities. And currently, the Connemara Library is one of the largest in all of Asia and is also one of four National Depository Libraries (these libraries receive copies of all books, newspapers, and periodicals published in the country). It also serves as a depository library for the United Nations. Every inch of wood in the library is designed with leaves and flowers and even on the tall pillars, you can find intricate design work. Relaxing in one of these reading rooms, with the light spilling through the glass work is something that you only find in books. While the library was originally only one floor, with the increase in books and demand, an adjoining three-storied building was constructed to accommodate all of the books that the library now has. 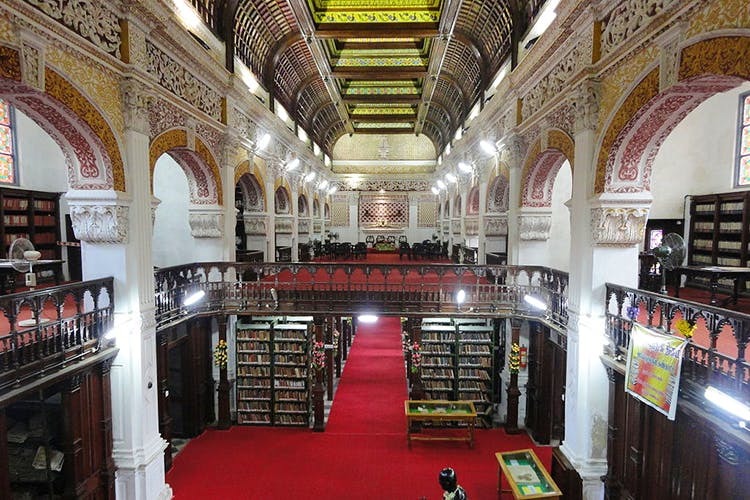 They added a Microfilm Unit, air-conditioning (because the Chennai summers are so unforgiving) and by 2016, the library also had eBooks available for members. And the best part is that you can access their entire catalogue online here so you can see what kind of books the library has in stock and just what you might find when you visit. The library is open from 9am to 7.30pm (Mondays to Saturdays) and from 9.30am to 6pm (on Sundays). Become a member by paying an annual subscription of just INR 50. This is for anyone who is over 17 years of age.